”I am trying to awake the energy contained in the air. During Nikola Tesla’s heyday, was no access to nano filters. But now the time has come, to implement Tesla’s visions. Finally, it’s possible, easy and cheap, to collect endless amounts of energy and water from the air, and eliminate the climate change. At last, the time has come to save animals, nature, your own and all other human lives. HyMeAir has a newly invented technology: ”Nano Towers”. PCT-application: PCT/SE2016/050491. Forget today’s dangerous megatrend ”renewable energy.” These medieval energy sources have already begun to destroy our future. Below is a brief introduction of the nano/graphene filter. Engineered porous materials for filtration are necessary for separation and purification gases which can as well find applications in other areas like the separation of CO2 from flue gas, biogas and filters for air quality control, amongst others. Polymers like (polysulfone (PSF), polyethylene oxide (PEO), polyimide (PI), polydimethylsiloxane (PDMS), and zeolites or carbon molecular sieves inorganic materials or porous nanoparticles in a polymeric matrix (mixed matrix membrane) have been used for gas separation. Ultrathin membranes fabricated with MOFS (metal organic frameworks) and graphene oxides are currently attracting tremendous interest towards gas separation as these are thin and have suitable porosity facilitating rapid gas permeation. Due to the limitations in fabrication methods of Graphene oxide nanomembranes, high costs and stability concerns, very few of these materials have found application in industry where predominantly polymer-based membrane materials still rule the game. Graphene oxide prepared from natural flake graphites through one-pot synthesis processes opens new avenues for the fabrication of futuristic gas separation membranes. Example of standard atmosphere content is also showing the different molecule sizes. The molecules can be extractable separately or together, for example: To extract H2 + He + CH4 together via a customized graphene filter with holes that pass through these gases but not gases with larger molecules than CH4, and so on. One can tailor the desired type of nano filter/membranes, for example, a nano filter/membrane system that only let nitrogen and oxygen pass the filter. Forget today’s dangerous megatrend ”renewable energy,” these have already begun to destroy our future. Edwin Drake ”discovered” oil in 1859, which changed the world. We became temporarily, richer, saturated and healthier, very soon all this will be gone. If you and your children are to have a future, we must immediately start using entirely new technologies to get access to energy and water, as well as remove unwanted greenhouse gases. ”Medieval,” windmills, sunbeams, and woods can of course not save humanity. Now you have the opportunity to support the only innovation, simple technique, that within a few years will give humanity unlimited amounts of energy, water, and eliminate big amounts carbon dioxide – secure your and your family’s future. Easy to eliminate CARBON DIOXIDE! HyMeAir has an invention, a cheap and straightforward CCS-technique, a CO2- molecule ”trap,” that easy can vacuum clean the air from CO2 and eliminate the climate threat within a few years. The big question is: Why politicians, mass media, climate scientists and others, NOT want to use technology that immediately rescues our future? Why? Hundreds of thousands, highly paid, ”climate researchers” and mass media alert us every day. People are getting more and more worried. Politicians decide drastic, enormously expensive, meaningless and hazardous measures. Instead of daily alerts, screams of fear, and use of medieval ineffective energy sources must we, of course, do the most simple: ”Kill the Beast.” Within a couple of years, it’s too late. HyMeAir can easily start the CO2 eliminating process ”tomorrow,” to rescue you, and your family’s future. Too many have been manipulated: Wind, solar, biofuels, and batteries can not save the world. To rescue the world, we must immediately switch from medieval technology to new, modern. or should we ”kill the beast”? No one allows fire-fighters to sit down and speculate about the development and use their time to warn us about consequences of the fire, instead of actively trying to quench the fire. But how about climate? Today, the world pay many, many billions a year to an ”innumerable” number of researchers who, every single day scream and warn us of the impact of climate change on our future. But few scientists are actively trying to solve our climate problems, ”quench the fire,” why? This type of politic is of course insane. Who is responsible? We have to save the world. We must, of course, comply with the Paris agreement. Many people realize that wind turbines, solar panels, forests, and batteries will never be able to save the world. These energy sources did not even work in the Middle Ages when we were half a billion humans, now more than seven billion. Nano filters made of: graphene etc are new materials, filters that will soon save the world – give us unlimited amounts of cheap energy and water and will also eliminate carbon dioxide. A graphene filter (GO) is carbon atoms connected to each other in a 2D layer and forms a filter/net. 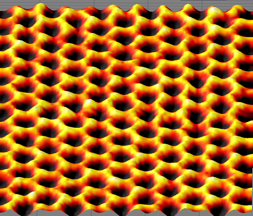 A graphene net is the world’s thinnest and also the strongest material, 200 times stronger than steel. Today graphene filter used as a strainer, e.g. for filtering unwanted molecules from water. The bonds, between the carbon atoms, can also be adjusted in length to allow atoms and molecules of a desirable size to pass. One can also increase the number of holes per surface unit, for example from 33% to 66% hole per unit surface, which provides more efficient filtration capability. In principle, graphene filters works in the same way as a chicken net or a strainer but at a nano microscopic level, by filtering out different sizes of atoms and molecules in air. HyMeAir has now applied for a patent on several features, based on taking care of the air’s heavy content of atoms and molecules. The air weighs about 1,3 kg per cubic meter. At an average wind of 10 m/s, 13 kg of atoms and molecules per second penetrate through a single square meter chicken net, 410 million kilos per year! Let’s make the net bigger, 100 000 m2, then 41 000 billion kilo atom/molecules will penetrate the net every year. Air, wind and nano filters can filter endless amounts of energy molecules, or water molecules, as well clean the air from climate gases and other unwanted molecules, bacteria, viruses, and particles. To complete the development has HyMeAir begun a collaboration with world’s leading experts in nano filtration, professor and research team at the Royal Institute of Technology in Sweden, KTH. During Nikola Tesla’s heyday, was no access to nano filters. Now the time has come, to implement Tesla’s know how and visions, take care of the endless amount of energy in the air that surrounds us. Great technology needs Great partners; You and Your Company may also want to become historical by actively participating, with your resources, to change the future of humanity? The memory is short; this companies also invested big in ethanol, gas, diesel etc! Unfortunately, these ”medieval” sources of energy and the rapidly increasing economic subsidies will accelerate corruption and the world’s downfall, probably within ten years. However, Mauna Loa exact measurements since 1950ties show that emissions are increasing faster than ever before, from 400ppm 2013 to 410ppm April 2017! This fact show, more ”renewable energy” probably create much bigger emissions. UN, IEA, and others, spreading of incorrect information have severe consequences for our future. To survive, we must stop the tax money supporting the use of wind turbines, solar cells, biofuels, and batteries, at once. Additional bonus: In average every person in the world will then pay USD 1 000 less in tax money. The air contains enormous amounts of cheap ENERGY! Everything is energy. Energy is indestructible. Energy always transform. Humanity can therefore never ”overuse” energy. To transform energy via today’s ”hysterical” methods, called ”renewable energy,” costs enormous amounts of energy, which speeds up the decline of humanity. At once, we must stop spending our money to scream and warn about climate change, instead try to find new energy sources. The air contains all the energy we need, very cheap and relatively pure energy. The air’s energy content will soon replace all fossil energy as well as all other energy sources, rescue the future of humanity. One cubic meter of air contains a couple of dozen molecules and atoms, together the weight is more than one kilogram, 1,3 kilo. The air in a living room weighs 100 kilos. Air contains small amounts of energy gases methane 0.0002% and hydrogen 0.00006%. One cubic meter of air contains an incredible amount of atoms and molecules. If one were to enlarge all atoms and molecules in one single cubic meter of air, to the same size as one pea, then the whole globe would be covered in a massive layer of peas. There are so many atoms and molecules that each atom or molecule collides with another atom or molecule, two million times each second. Because different atoms and molecules have different sizes, one can filter the molecules one want to access to if one has a sufficiently fine mesh filter. In recent years, scientists have begun developing fantastic filters that can filter atoms and molecules, nano filters, such as graphene filter (GO). With the help of custom made nano filters, we can now filter out the molecules we want to access, such as hydrogen, methane gas, water vapour and greenhouse gases such as carbon dioxide and others. As easy as a strainer separate rice from peas. There are huge volumes of air. The atmosphere contains so much methane and hydrogen that these energy gases manage to cover the world’s total energy needs. Take care of energy gases within the air; a power source is needed. The wind is always present. The wind is a tremendous force that can destroy entire cities and drive large wind turbines. How much energy will air, the wind and graphene filter deliver per year? All we need, cheap and clean! One year = 31.5 million seconds. Many places have a mean wind of 10 meters per second. In one year, 315 million cubic meters of air blows through one square meter chicken net. In one year, 630 cubic meters of methane gas blows through = 6 900 kWh of energy. In one year, 190 cubic meters of hydrogen gas blows through = 580 kWh of energy. With 100 percent efficiency, a square meter filter catches approximately 7 500 kWh of energy for one year. If one increase the filter to 30,000 square meters, one get 225,000,000 kWh. Compared to a chicken netting, of course, a nano/graphene filter has limited penetration ability. One can today design graphene filters that can filter molecules in the desired size. One can also increase the part of the filter that forms ”holes,” from for example 33 % hole to 66 % hole, per unit surface. That sounds good with 66 percent, but it’s not the whole truth. Although graphene filter is extremely thin, 0.00001 millimetres, it looks thick in a microscope; the ”holes” consist of ”channels” which limits the penetration ability of molecules slightly. An advantage is that the graphene filter can not clog, by dirt. A chicken net has a permeability of 100 percent; a graphene filter will, therefore, have penetration capacity of only about 33 percent, although the filter made with 66 percent hole per surface unit. How are the molecules captured? A straightforward and cheap round tower, built by many slim framework poles placed in a circle, ”wrapped” by graphene filter. With a ”Nano Towers” 100 meters in diameter, 200 meters in height, one get an active filter area of about 30,000 square meters, regardless of where from the wind blows. Such a ”Nano Towers” will be quiet, have the same height and look like a ”fat” wind turbine, without any rotor blades. With 33 percent efficiency, a ”Nano Towers” produces 75,000,000 kWh per year, which is 15-20 times more energy than the energy obtained from a land-based wind power plant. One can also build ”Nano Towers” which only captures hydrogen gas or methane gas. 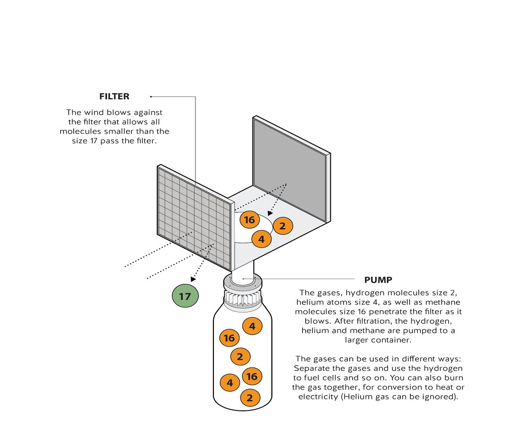 One hydrogen gas tower, deliver clean, more and cheaper energy than a wind turbine. One methane gas tower would provide more energy than 15 wind turbines. Construction and operating costs for this ”Nano Towers” can be lower than for a wind turbine. The life expectancy would be at least twice as long as a wind turbine because a ”Nano Towers” does not have moving parts. Including total plant investment costs, operation, maintenance, and scrapping, the energy price, total production cost per kWh, is likely to be around USD 0.005 per kWh. For a ”Nano Towers” that only produces hydrogen gas, the energy cost can be USD 0.06 per kWh. Significant lower energy prices than any other source of energy. The world will be much richer. Forget today’s dangerous megatrend ”renewable energy sources,” these have already begun to destroy our future. Edwin Drake ”discovered” oil in 1859, which changed the world. We became temporarily, richer, saturated and healthier, very soon all this will be gone. If you and your children are to have a future, we must immediately start using entirely new technologies to get access to energy and water, as well as remove unwanted greenhouse gases. ”Medieval,” windmills, sunbeams, and woods can of course not save humanity. Now you have the opportunity to support the only innovation that can give us unlimited amounts of energy and water, and eliminate big amounts carbon dioxide – secure your and your family’s future. Within ten years we will probably become poor and be in a war! Have you heard this ”fact”? ”Renewable fossil-free energy”. In 2013, I started a study on climate threats and energy sources. I became increasingly concerned, enormous state subsidies, malus bonus systems, daily bluffs and lies. When researchers, mass media, and politicians began to claim that wind power, hydroelectric power, solar panels, wood, and batteries are ”renewable, fossil-free energy sources” I was horrified. It’s well known that 86% of all energy we use is cheap fossil energy. E.g., the production of food and water for a human requires an average of 7,000 kWh per year, mostly cheap fossil energy, 86 %, which is a quarter of all the energy a person in average use. There is no energy source, not even people, that are ”free” from fossil energy. 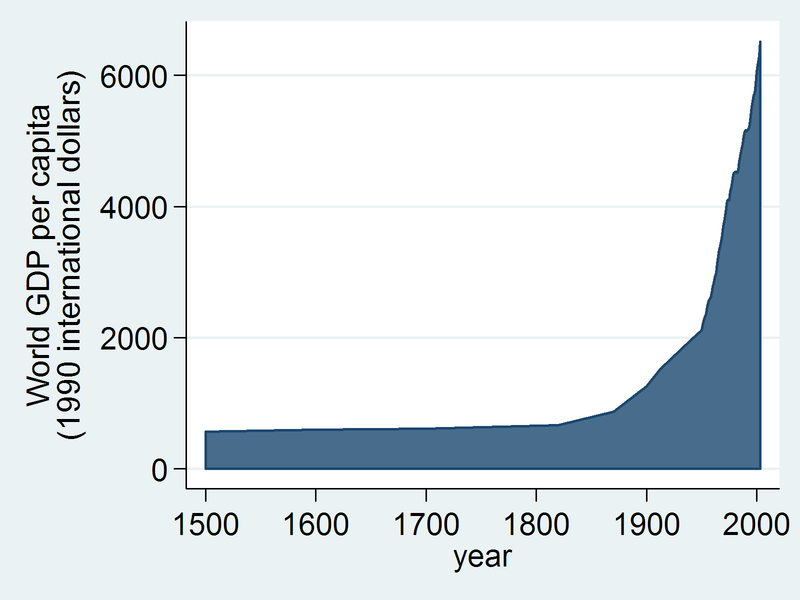 Soon, the world’s population will have increased by 50%! When building, operating, maintaining and scrapping wind power, hydropower, solar panels, wood, and batteries are in average used 86% cheap fossil energy. There is no ”renewable, fossil-free energy. Improved medieval technology: wind power, solar panels, biofuels, and batteries can, of course not, save us. All who claims that, are lying or don’t know. The worst is that it will soon, inevitably, lead to major conflicts, massive refugee streams, and war, all over the world. Slightly improved medieval technology: wind power, solar panels, biofuels, and batteries can, of course not, save us. The insight ”forced” me to try to find a new endless energy- and water source. My wife and I have 14 children and grandchildren; We want us and all other people in the world to survive and to get a good future. Immediately after E. Drake found the first major oil source in 1859, our world became much richer, healthier and we began to live longer. The above income curve also coincides with the rate of increase of cheap fossil energy, as well as population growth. Cheap fossil energy accounts for the main part, 86%, of our energy consumption. The use of fossil energy is rising steadily every year. Expensive wind power and solar energy are negligible, only 1.5%. The worlds tremendous tax support to costly wind power, solar panels, and batteries/ electric cars, of course, means that we now systematic steal money from poor people/children and give that money to rich persons, e.g., rich electric car buyers. The average income is very unevenly distributed. Unfortunately, today we have several more extremely poor, 800 000 persons, than the world’s total population during the Middle Ages. We, of course, at once need an entirely new, enormous energy- and water source, that can rescue our families and our world. Air contains all clean WATER we need, to a fraction of today’s cost! In spite of this fact, nearly two billion people lack access to clean water, which means that 1000 children die of contaminated water – every day! People’s hard exploitation of our globe hurts nature and animals. Water shortages now also begin to hit rich countries like the US, Sweden and many other. Water shortage is already a major problem, and in the coming years, it will be a catastrophic world problem. Water shortage will inevitably trigger conflicts, refugees, and war. HyMeAir solution: Air, wind and nano filter will give humanity water everywhere! On average, every person in the world consumes 1 500 m3 of fresh water per year. Household water only about 3%, 45 m3; the rest is industrial water, agricultural water, etc. In poor and hot countries, many people can not even get enough drinking water and household water, which causes illnesses, death and low working capacity. In poor tropical countries, water is often very costly. The world thus needs sufficient access to clean water – everywhere. Water, the gas molecule H2O, exists in various amounts in the air. 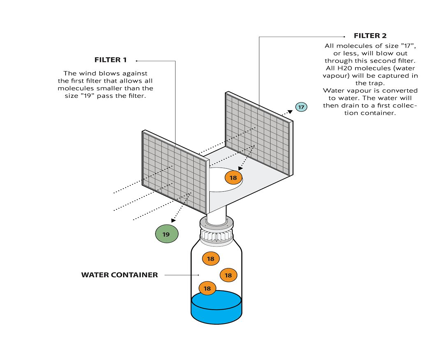 HyMeAirs simple technique, filtering the air’s molecules using the power of the wind, and graphene filters, can give the whole world all the water we all humans need at a fraction of today’s cost. HyMeAirs technology has no moving parts and requires no electricity. Small water towers can, therefore, produce domestic water and drinking water for humans and livestock in remote villages around the world. Hot air normally contains more water than cold air. The number of water molecules, water vapour, in the atmosphere varies regularly, even locally. In the following example, we have calculated air containing 10 grams of water molecules per cubic meter of air. We have estimated an average wind of 7 meters per second and estimated that the graphene filter has an efficiency of 33% (takes care of 1/3 of the water in the air).A round hollow tower, ”wrapped” by two different graphene filter, becomes cheap and efficient. Whatever wind direction, the wind will with maximum force always meets a side of the round tower. The space in the tower can use as a water tank. The filtered water becomes 100 % pure; one adds small amounts of suitable salts and minerals. A small round water tower to capture household water for families and small villages. A tower that has a height of about 2.5 meters and a diameter of about 0.5 meters gives a graphene filter area of two m2. With the above assumption, this small tower would provide four m3 of water per day, 4,000 liters of clean water per day is sufficient to give 30-40 people adequate access to domestic water. Sometimes it blows more, sometimes less; the tower should supplement with a water tank. The mass production cost can estimate at USD 100-200 per water tower. Lifespan 20-40 years. The cost of the water tower will then be around USD 1 per month. A large water tower, 200 meters high, 100 meters in diameter. A straightforward, cheap round tower, built by many slim framework poles placed in a circle, wrapped by graphene filter. 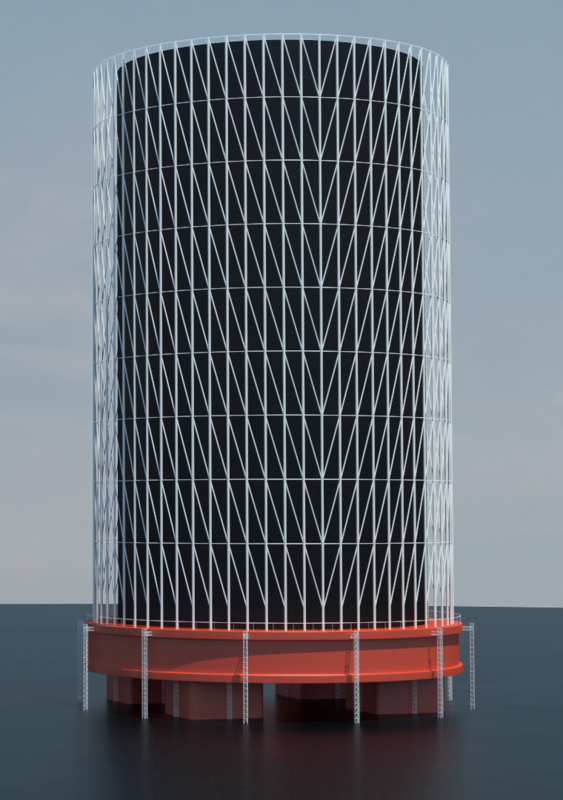 This tower will have the same height as a wind turbine but be thicker. Such towers placed in connection with cities, agriculture and industrial areas. With the conditions mentioned above, this tower would provide a water volume of 22 million cubic meters per year, which accounts for 14,000 people’s total water consumption, including domestic water, industrial water, and agricultural water. The world would get all freshwater needed with 500,000 such water towers. With a life span of 40 years, one would only need to build 12 500 towers per year. The cost of a water tower is estimated to be the same as for a wind turbine, typically USD 12 million. The cost of world water need would be around USD 150 billion a year, which will only be USD 2 per person per month, about 10% of current water costs. A NEW INNOVATION that gives you fully clean air in your car, in airplanes, shopping malls, hospitals, and in your home. Nano filter ventilation that even filters out viruses and bacteria. HyMeAirs innovation, patent pending, can be used in all enclosed space where one need or want fully clean air. HyMeAirs filtration system can also increase the amount of pure oxygen in the air. An external filter ventilation system that filters the air, before the air pumped into the room. An internal system that circulates and purifies the air within the room. At last, now you can experience fresh and clean air that does not contain microbic dirt, bacteria or viruses. Ventilation companies interested in manufacturing license can contact HyMeAir via email. 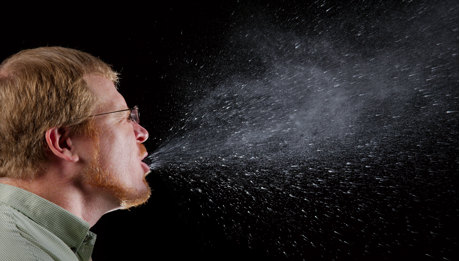 Even the smallest types of viruses and bacteria are many times larger than, for example, oxygen molecules (O2). Therefore, viruses and bacteria can not penetrate the nano filter. The ”renewable energy” can’t rescue us, but air-, wind- and nano filters can. That’s the only technique that can save the nature, animals and the humanity, our entire world. The improved medieval energy sources as windmills, solar rays, wood or batteries can of course not save the world. Why have so many parents already given up the original idea? Fact: 86 % of the energy we use is fossil energy, 1,5 % wind and solar. Your tax money to ”renewable” is enormous, soon 10 % of your money. ”Renewable energy sources” is, unfortunately, a tragedy. Why? ”Renewables” seems to increase the emissions – rapidly. However, there are new technologies that can solve our energy- water-, and emission problem. The air contains 1.3-kilo molecules per m3, including energy, water, and greenhouse gas molecules. With new technology, nano filters, we can take care of the air’s endless amounts of energy and water, as well as eliminate the climate gases. Do you want to rescue our lives and the future for our children? Air, contains energy: hydrogen and methane, also water and greenhouse gases. The wind is mighty, only 4 meters per second and the enormously heavy rotor blades on a wind turbine will start to rotate, 10 Newton per m2. In many places, the mean wind is 10 meters per second, 60 Newton per m2. Nano filter, designed to capture the molecules one want to extract from the air. 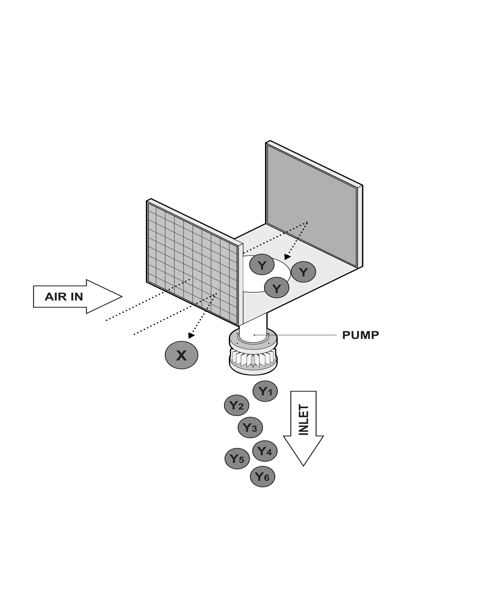 A small pump, the filter systems can supplement with a pump that creates a slight negative pressure. The technique is no longer basic research; it´s now applied research and development step. HyMeAir has filed a PCT patent application in 148 countries, a technique that will eliminate the climate change and give us an unlimited amount of energy and water from the air. Technology based on simple principles, air, the wind and the latest type of nano filters. Graphene, and other nano filters can nowadays be manufactured with the desired ”hole size” to suit the air’s different ”sizes” of molecules. 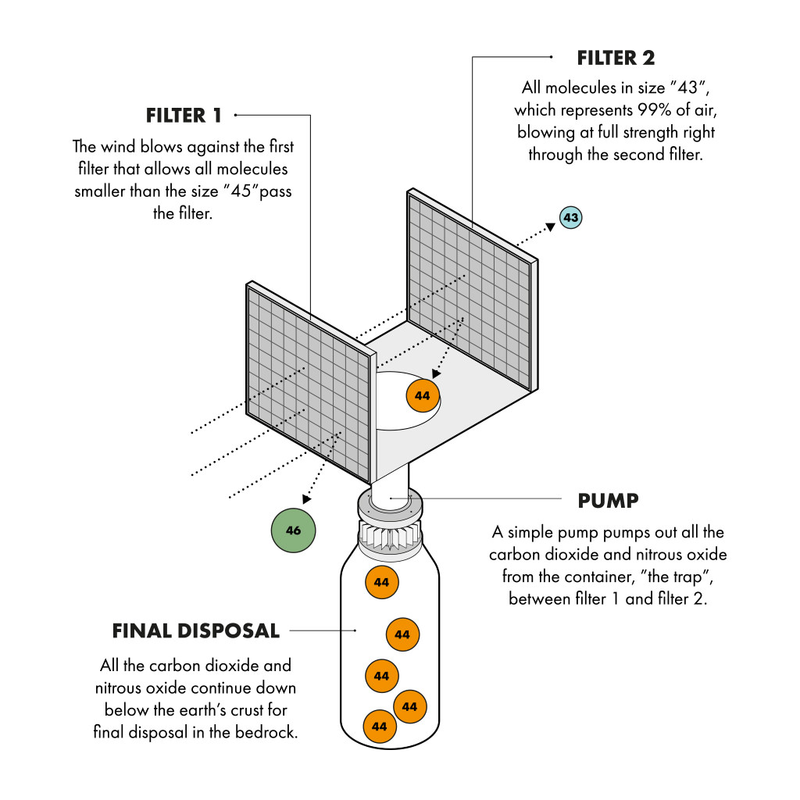 E.g., nano filter is today used for filtering water from unwanted molecules. We, KTH, have filtered out the air’s smallest molecule, hydrogen gas, from the air. For increased permeability, the part of the filter area that is holes can manufacture for exceeding 60 percent of the filter surface. Nano technology (nm): Consist of dimensions less than 100 nm. 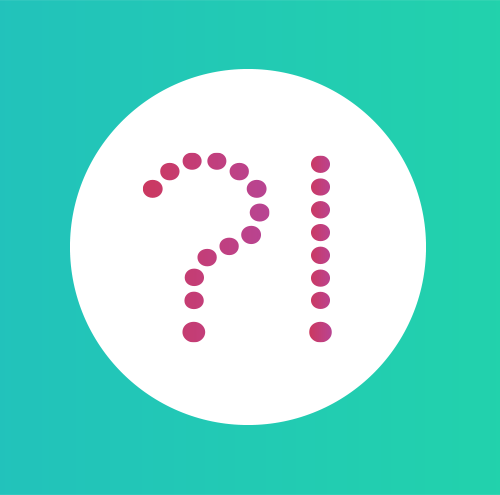 One nm is one million part, of a millimeter. To capture and take care of the energy gasses out of the air. The hydrogen molecule (H2), is ”size” 2. The methane molecule (CH4) is ”size” 16. A filter with a ”hole size” less 17, can therefore, separate hydrogen and methane out of the air. Then the energy gasses are collected in a tank. There is so much hydrogen and methane gas in the atmosphere that these gases cover the world’s energy needs. The greenhouse gas carbon dioxide (CO2) and nitrogen oxide (N2O) molecules ”size” is 44. A graphene filter with a ”hole size” 45 can let through both these greenhouse gasses when it blows. The next graphene filter has a ”hole size” 43, which means that the carbon dioxide and nitrous oxide caught in a trap. Air consists of 99% of nitrogen (N2) with ”size” 28 and oxygen (O2) with ”size” 32. That means that almost all captured air blows right through the climate gas trap, with full force. Climate gasses are then led down into the earth’s crust for permanent storage. Unlike today’s use of CCS technology, HyMeAirs CCS technology at little cost can reduce the air and atmosphere’s climate gasses from 410ppm to 300ppm within a few years. We never more need to worry about climate change caused by people. We never need to organize climate meetings or build wind turbines, solar panels, batteries or biofuels. One of the world’s biggest problems is the lack of pure water. The same type of ”molecule-trap” as the greenhouse gas ”trap” but with another hole-size in the graphene filters (19 and 17), can be used to capture the gas molecule H2O ”size” 18 from the air. The ”trap” will give unlimited access to clean water in all countries in the world, at little cost. The most efficient way to capture molecules from the air is to build round towers covered with nano filters, ”Nano Towers.” Whatever wind direction, the efficiency will then maximized. One can of course also build a nano filter trap that only captures hydrogen molecules (”size 2”). This gas trap will of course also capture many other hazardous gases having a greater molecular size than ”44”, for example, HFC-23. HFC-23 is a climate gas where one tonne is considered equivalent to 12,000 tonnes of carbon dioxide – the greenhouse effect. For more efficient filtration, the part of the area that consists of ”hole” space should increase as much as possible. With today’s technology, it is likely that the ”hole” space can increase up to 66 percent, which means that a graphene filter ”hole” surface can reach up to two-thirds of the total filter area. Simplified example: When the wind blows against a chicken netting (filter), all molecules and atoms in the air blow to 100 percent, through the grid. The air weighs about 1,3 kg per cubic meter. At an average wind of 10 m/s, 13 kg of atoms and molecules per second penetrate through one square meter chicken net. Wind 10 m/s = dynamic pressure 60 Newton/m2. The wind is very powerful. It only takes 4-5 meters per second (called weak wind) = dynamic pressure 10 Newton per m2, so that the enormously heavy rotor blades on a wind turbine will start to rotate. One Newton = move one kilo, one meter, in one second. Humans use 180 000 billion kWh energy every year, average 25 000 kWh per person, e.g., 6 000 kWh for food production. Almost all the energy we use is fossil energy, 86%. The fossil energy use increases every year. We only use 1,5 % wind- and solar energy. We release 40,000 billion kilos of greenhouse gases, 5, 000 kilos per person, each year. The emissions now increase faster, than ever before in history. That is a frightening intervention that might affects the climate, nature, and humans. Of course, it would be much better if we do not release these greenhouse gases. But why have we started giving our money to fake medieval technology, ”renewable energy sources,” to people and business that will seriously hurt you and your children’s survival and future? But the ultimate insanity – is to believe that ancient energy sources can save the world. If you and your children are to have a future, we must immediately start using entirely new technologies to get access to energy and water, as well as remove unwanted greenhouse gases. Medieval windmills, sunbeams, and woods (or batteries) can of course not save humanity. We need to fulfil the primary intentions of the Paris Agreement. What to do…? Mass hysteria, created by mass media and money makers,” renewable, fossil-free energy sources,” medieval windmills, sun rays, forests, and batteries have already begun to contribute to increased emissions. ”Renewables” apparently costs massive amounts of very cheap fossil energy to build, from mining to scraping, which increases the emissions of greenhouse gases. No one would build ”renewable energy sources” if one removes the tremendous contributions and bonus/malus systems, which now is spread all over the world. The total climate cost included contributions and effects of bonus/malus systems amount to $ 7,000 billion according to IMF, soon 10% of global GDP, USD 1,000 net per each person in the world. This massive cost increases, with the speed of lightning, every year. It is you who pay, and you will soon pay much, much more, through higher prices and higher taxes. To save the future of ours and our children. Instead, we have started the biggest race in our history: ”Follow The Money” and grab as much as possible – fast. No one would allow, fire-fighters to just speculate about the development and the final consequences of the fire, instead of actively trying to quench the fire? The climate? Today, the world probably pay at least $ 100 billion a year to an ”innumerable” number of climate researchers who, every single day warn us of the impact of climate change on our future. There are much more ”climate researchers,” than scientists trying to solve the world’s energy and CO2 problems. This type of politic is insane. Who is responsible for this madness? Teslas lithium battery for the home, ”Powerwall 2”, 14 kWh, which has already been subsidized in various ways in the USA and other countries, costs around USD 8,235 in Sweden, including installation. The Swedish state pays USD 5,880 in subsidies to the buyer! If all Swedish households were to buy this Tesla battery, this would cost the Swedish state 27 billion USD, one quarter of the Swedish state budget. Mauna Loa is the measurement station that the world follows since the 50’s. In 2013, the carbon dioxide content of 400ppm exceeded for the first time. At 2017, 410ppm exceeded. The carbon dioxide content has never increased faster than today, 2,5ppm per year. This fact show, it’s likely that ”renewable energy” and batteries create much bigger emissions. Sweden has invested billions; the result is that this has worsened Sweden’s climate and environment! Access to energy is the key for humanity to survive. Of the world’s energy, 86% comes from fossil fuels, only 1.5% of wind turbines and solar panels. The world’s consumption of fossil fuels increases every year. Massive amounts of cheap fossil energy are needed to produce wind turbines, solar panels, biofuels, and batteries. For example, a wind turbine costs so much energy to build that it is barely able to produce equivalent energy in its short lifespan of 20 years. Without fossil energy, you and all people will become 86% poorer. We need to find a whole new energy source. ”Renewable energy” de facto costs at least 10 times more to produce per kWh compared with fossil energy. Producing a liter of biofuels also costs 70 times more clean water than producing one liter of oil (UNESCO-IHE), and so on. Electric cars feel nice and climate friendly. On YouTube you can see that every step of the production of a Lithium battery requires a tremendous amount of energy. It’s easy to understand that about half the price for a lithium battery is energy cost – cheap fossil energy. In spite of this, taxpayers, during mining to scrapping, have to support lithium batteries, up to 70 %. Despite this, an electric car is very costly to buy, because of the extremely energy consuming and therefore costly battery. Your tax goes to already rich persons. Climate change: Included battery production, an electric car let out up to three times more carbon dioxide than a petrol car, during 150 000 kilometres lifetime. When so enormous ”free” tax money is support, you can not trust any information about ”renewable energy.” More or less everything, is nowadays, fake news. It has now become impossible to find out the facts. The spider web: of support, targeted subsidies, certificates, emission allowances, targeted taxes, bonus/malus systems, different in the various countries, is now so complicated that no research group or organization in the world can figure out the consequences. We have now opened Pandora’s box. Look at Tesla’s price list for ”Powerwall,” see that lithium battery has risen in price from USD 350 per kWh 2015 to USD 392 per kWh 2017, within two years, up 12%! It’s true, but this is terrible. In the United States, they say that 140,000 people now work with solar energy and only 80,000 in the coal industry. That is awful; the coal industry supplies 100 times more energy in the United States than the solar industry. To continuing that ”development” will soon force half the US population to work on producing ”renewable energy,” to survive. Have you heard this ”fact”? ”We use green energy for the manufacture of our green products”? Since 86 % of all energy is fossil energy, of course, this statement is not true. Although anyone could use 100%, of the non-existent ”green energy,” it means, of course, that someone else uses more fossil energy, no greenhouse gas change. That is easy to understand. IT develops explosively. It is a natural law that IT becomes more efficient and less energy-consuming due to smaller and smaller transistors. Many believe that other technologies can improve as fast as IT, forget it, it is opposite. For increase the efficiency, a wind turbine must, for example, be built larger and higher. Most understand this, but….? It is a natural law that this type of technology development, ”renewable energy sources,” and batteries, can not change reality to a considerable extent. The truth is that ”renewable energy” costs ten times more energy to produce than fossil energy. Producing one barrel of oil costs averaging about USD 0.01-0.02 per kWh. Producing one kWh of rather inefficient ”renewable energy” costs ten times more, USD 0.1-0.2. Using the Internet, it only took ten years to spread a false belief that wind power plants, solar panels, forests and batteries can save the world, of course, it’s not true. This belief includes not only ordinary people but also heads of government and researchers. Simple facts are that energy is indestructible. Energy always transforms to energy. Of course, it costs enormous amounts of energy to convert, for example, a rock to another energy. It requires less energy to convert the wind, solar and wood to energy. Unfortunately, even this conversion sometimes cost more energy than we get in return. A human is consuming about 70-100 watts per hour, an average of 600-900 kWh per year, but the energy required, to produce the food, costs ten times more energy, 6,000 kWh to produce and distribute, 85-90 percent are energy losses. Most energy conversion gives high losses. The wind, solar, wood, and batteries are not a good way to get energy. We need to find better energy sources – fast. Anyone who, for a few years, devotes his time to finding out facts understand that today’s hysterical megatrend is pure madness. Building a 200-meter high wind turbine that transforms the wind to energy, naturally, requires massive amounts of energy. After we built this wind turbine, we get minimal amounts of energy, typically 100 million kWh, during 20 years. Most people understand that the cost of producing wind turbines, solar panels, biofuels or batteries reflects energy consumption. Dreams, believe and fairy tales do not help nature, animals, and people to survive, on the contrary. The ”green dream world” also includes our food. Organic food is roughly as little poisonous like other foods. Organic food contains mold, fungus, and microorganisms, but it´s a minor issue. The biggest problem is that organic food production requires nearly twice as much land, many more agricultural workers, and has little durability. Organic food is therefore costly; we need much larger globe if everyone begins to eat organic food. Poor humans can’t afford to eat. If you give your child an echo banana, then you let a poor child starve, even more. The ”good green” want to go back, want to experience that once more. They want us to once more to start eating ecologic food and use medieval ”renewable energy”? The vaccine has managed to eliminate most diseases such as smallpox, measles, polio, tetanus, diphtheria, tuberculosis and several serious diseases. Chemically medications quickly cure complex and simple diseases. Most ”green” love the vaccine and eat chemical medicine, which rescues our children, and we survive the cruel nature when we do the same; But to ”vaccinate” our food production to survive, is wrong? Hard to understand the logic? We will soon reach a point where ”winnings” from all support systems will destroy our world. Due to mass media fake news, ideological and financial interests, it takes at least one year of full-time studies to acquire basic knowledge about the climate, energy sources and gain a little insight into the world’s increasingly complex subsidy system. It’s a fact that industrial-producing products cost a lot of energy. Energy always gives rise to emissions. Of course, you must count on all energy consumption. From projecting a mine, making use of materials that interest you, refining the material in many stages, transports that must also include energy costs for building the transport machines, production in many stages, when the product is ready, it must be driven and maintained, and finally, scrapped. Every little step costs energy. For a wind turbine that typically costs USD 15-25 million, during its lifetime, about half or at least one-third is energy costs. The wind turbine will only deliver 100 million kWh energy during its lifetime, about as much energy as it cost to build, drive and scrap. Whether one build a wind turbine, solar cells, batteries or produce biofuels, the true net production price reflects the amount of energy consumed to produce. Those who have devoted their time to finding out facts, understand that today’s hysterical megatrend and enormous tax support to ”renewable fossil-free energy” is pure madness. For three years I studied full-time climate and energy issues. When the truth became frightening reveals that the wind, sun rays, wood, and batteries, ”renewable, sustainable, fossil-free energy sources” have no way of solving our climate and energy problems. That they instead represent our worst climate threat, I was forced to spend two years trying to find a solution, a new source of energy. My driving force was that I have six children and seven grandchildren. Unlike the politician, ”good green” and mass media, etc., I truly want my children to survive and have a good and healthy future. ”I am trying to awake the energy contained in the air. There are the main sources of energy. 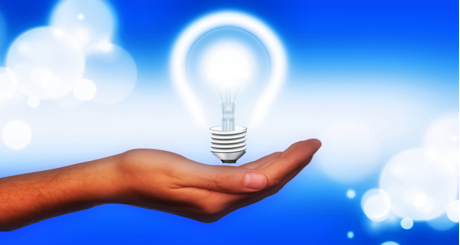 Now I have applied for patents of new energy supply: air, wind, methane gas, hydrogen gas, and nano filters. The same technique can also reduce the greenhouse gases and give the world unlimited amounts of clean water. Therefore, we can no longer rely on green organisations, politics, mass media or others. Most ”leaders” already have their fingers in the jam. Many don’t longer care about you or your children’s future. But together, with other sensible persons, you can now start to rescue our world. A NEW INNOVATION, a gas mask system for extraction of desired gaseous molecules from the ambient air. Nano filter mask that even filters out viruses and bacteria. The filter system can also increase the amount of oxygen in the inhaled air. HyMeAir NEW INNOVATION, protective mask, patent pending, can be used where one need or want clean air. The respiration mask can manufacture in many different ways. Full mask, half mask, and variants. Since filtering takes place via nano filters, the masks are equipped with a pump system to facilitate breathing. The pump system can be integrated with the mask or separated from the mask. Of course, it’s possible to make cheap masks, e.g. working with a slight over-pressure, providing significantly better protection against nano particles, viruses, and bacteria, than a simple paper protection. 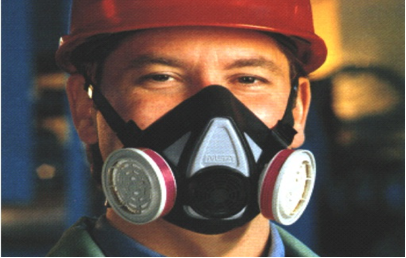 Protective mask companies interested in manufacturing license can contact HyMeAir via email. Innovation 2017: Ventilation that even filters out airborne viruses and bacteria. A new HyMeAir-innovation that gives you entirely clean air in your car, in airplanes, malls, hospitals, and in your home. Air, pumps and nano filter is the patent pending solution. Ventilation systems in buildings and vehicles and gas mask that filters out unwanted particles, but also filter away airborne viruses and bacteria from breathing air, and can even increase the amount of oxygen in the air. During Nikola Tesla’s heyday, was no access to nano filters. But now we have nano-filters, the time has come, to implement Tesla’s visions. The air we breath contains molecules of different size, hydrogen, methane, water, carbon dioxide, etc. With new nano-filter technology we can now easily, and quickly, take care of the molecules we want. Finally, it’s possible, easy and cheap, with the help the power of the wind, to collect endless amounts of energy and water from the air, via the latest type of nano-filters. The same technique can also eliminate the climate change. This innovation is the only technique that within a couple of years can save humanity. Forget today’s very dangerous megatrend ”renewable energy”: Wind turbines, solar panels, wood/biofuels and batteries can of course not save our world. These medieval energy sources have instead already begun to destroy our future. But at last, the technique and the time now have come to save animals, nature, your own, and all other human lives: Air, the power of the wind, and nano filters. HyMeAir has begun a collaboration with a research group at the Swedish KTH Royal Institute of Technology, to quickly give you and the whole world a bright, clean future. The research team, who are experts on graphene- and nanofiltration, is lead by one professor at the KTH and the inventor Claes Persson. Our simple, initial test succeeded in separating hydrogen, the smallest molecule. We are now in the follow-up phase of more stringent, scientific testing. HyMeAir is a Swedish company founded by Claes Persson 2016. Claes is a serial entrepreneur with many successful launches since 1968. Claes has even established a computer company that in the 90s became Sweden’s most fast-growing company and the winner of the Swedish stock exchange. HyMeAir/Claes has created several new innovative processes. The innovations 2016 will save our world from ongoing climate change, and will also give us all energy and water we need. The latest innovations, 2017, ventilation systems, and gas mask systems will provide us with air, free from viruses- and bacteria. Innovative, simple products built on elementary physics and atomic physics, simple to understand, and simple to manufacture. All who are interested in our survival and the future are welcome to contact HyMeAir. Nature’s vast source of energy is – fresh air! Current energy sources, problems and volumes. Everything is energy, even the air around us, so why not make use of the vast amounts of energy in the air? Nano Towers, so simple solution, why haven’t anyone done this before? The air we breathe contains more than 100 times as much energy as the energy that a wind turbine can extract from the wind. The amount of methane and hydrogen in normal air via Nano Towers. There are plenty of inventions that have come about by chance.